When we got together in college it was so basic. You’d send a mass text with someone’s apartment location and everyone would pool together money for the bare essentials. Those essentials usually consisted of readymade mac & cheese as well as cheap beer! Let’s face it, most of us were living on a dime and it was more than acceptable to eat off paper plates and survive off $5 Dominos pizza! I knew one day I would become an ‘adult’ and eventually graduate from disposable plates to proper table ware. In a perfect world we’d continue to live that same carefree life, but as with most things, we get older and our taste develops based on our life experiences. I got married at the ripe age of 24 to my childhood sweetheart. I remember being excited at the prospect of hosting “dinner parties” with other couple friends after marriage….that’s what people do after they get married, right? We headed to Bed Bath & Beyond armed and ready to scan items for our registry that we planned to use while hosting these “dinner parties.” At the time what we picked seemed amazing, but folks, It’s been 11 years and we are still using those same dishes . Just like furniture and clothing, serving ware needs updating too….who knew!? We’ve recently been hosting more often and every time I pull out my dishes I cringe! I asked around and got some suggestions on places to go without breaking the bank. I picked up some cloth napkins, napkin holders, and fun silver wear from Pier 1 and some gorgeous placemats and beautiful Ito plates from Crate & Barrel. It’s definitely not perfect, but its a start, and a fun way to feel good having people over! Is it bad that I might be addicted to wanting to have the perfect tablescape? With limited storage space in my house I’m only keeping what I absolutely need. Happy hosting! Oh an don’t forget to light a candle one hour before your guests arrive, my GO TO candle is Natalie by Natalie Frangrances – I know its a bit pricey but for the aroma it gives off, its totally worth it, I promise! Hello Chicks!! If there is one thing you know about us, its that we love to host our friends over and help women take a moment to themselves. 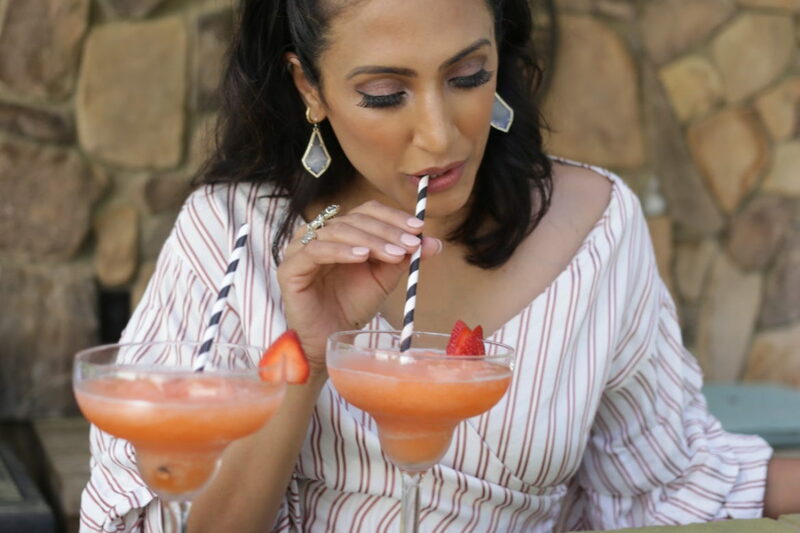 With a gorgeous weekend ahead, and a pool party on the horizon we could not help but pull out the blender and strawberries to make some our favorite 5 Minute Frosè!! We have perfected this super easy summer cocktail for you! All you need to do is plan ahead a little. The night before, freeze one bottle of rosè by pouring it into a freezer safe bowl. Then slice the strawberries and boil them with the water and sugar and chill in a bowl over night as well. When you are ready to serve, just blend the rosè, syrup ONLY from the strawberries (use a strainer), and the lemon juice you squeezed. Pour and enjoy! Garnish with Mint leaves or strawberries. Pro Tip: Save the simple syrup soaked strawberries for a smoothie later. Did you like this recipe?? Comment below! This time of year can seem super hectic! With schedules in school, at work, and socially in overdrive you may have run into some people that you don’t under ‘normal’ circumstances. Work parties, large family gatherings, and school functions may have you caught off guard when talking to what we call semi-strangers. Luckily, Savvy Chick, Avani, has a gift for connecting people and handling the inevitable interactions that come with being out and about during the holidays! We took on this topic during one of our recent Chick Chats. Check out the episode here! Be sure to listen all the way to the end where she really drops some wisdom. Let us know if you would like to hear us speak on a specific topic. Also, like us on Facebook to stay up to date with our latest chats and other thoughts. Looking ahead to fall and the holidays its crazy to think that 2017 is wrapping up and my calendar is already booked! Still when the holidays come around, I get the bug to get my friends and family together over food and fun. Growing up, my Mother taught me a lot about how happiness and memories can become attached to things like eating together. Every effort put forth to make a meal ‘special’ was always acknowledged. Along the way, I picked up a few quick and effortless tips that I use time and time again. These tips are meant to show my guests how much I appreciate them. So with the help of some old school tricks from my Mom paired with the genius hacks of Pinterest (check out our Party Board), here are some dinner party secrets that will make hosting a breeze. Piggy backing on the mason jar trend, old bourbon, tequila, and scotch bottles make for great variety and décor on a table top. There is nothing like the fragrance of fresh flowers and greenery from the yard. Yep, even if you don’t think you have pretty bushes, you do! 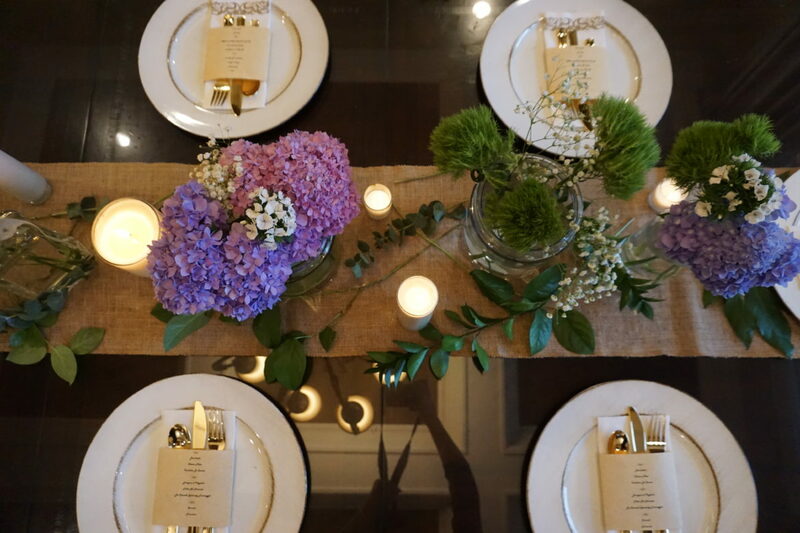 With the help of some candles, ALL (yes, all) greenery livens up a table top. Bring the outdoors inside whenever you can. Setting the tone with earthy additions to your décor is trendy and familiar. I love either stocking up on readymade family dinner items from the grocery store or catering for a get-together. I have found that catering from a restaurant that you may think is expensive can often times be cheaper than eating there. Make a budget and get a few quotes, I think you will be surprised. Bear in mind that by outsourcing the cooking you stay focused on the decorating and presentation of the meal. Hosting a potluck is another great way to use food as an excuse to bring people together — and cut down the effort you need to put in! For a dinner party, I take the extra 5 minutes (literally 5 minutes) to print out the menu onto paper. Then cut the printed paper into narrow sheets, and tape them around the napkin to create a more formal feeling to the evening. Labeling the food is a quick way to feel fancier and show your guests you made an effort. The combination of glass bottles, earthy accents from the yard, a proper table setting, and relaxed atmosphere is truly the backbone for a perfect evening. Sometimes, I will hire a bartender and created a signature drink for the evening. Speaking of, if you have not tried a French 75 yet, I highly recommend ordering it on your next date night. We used the recipe from Epicuious to get the party started. I know hosting can seem overwhelming when you decide to do it. Making a list of things to do and crossing one thing off a day, you won’t need more than two weeks to comfortably throw a fun dinner party where you can focus on the most important thing of all: time with loved ones.